For the computer to make sense of it, the normally continuous spatial dimension "x" must be discretized. This is what this node does. In essence it represents the boundaries and the accuracy of the simulation. This node is the basis of all spatial simulations done in Composer. 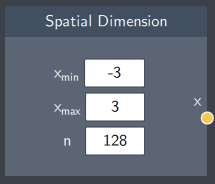 Spatial Dimension contains 3 input fields that are used to generate the discrete spatial dimension. The upper inputs represent the lower and upper boundaries of the spatial dimension, while the last input gives the number of points in the generated space. The bounds directly represent the bounds for the simulation. As far as the simulation is concerned, space is one-dimensional and lies only between x_min and x_max. This leads to weird numerical behaviour if a wavefunction gets too close to the bounds. The number of points in the linear space is very relevant for the accuracy of the simulation. Due to technical reason it should be a power of 2: 2,4,8,16,32,64,128,256, ... Typically, 128 gives good accuracy, but in some cases it is necessary to set that up to 256 or 512.